One of the reasons that I decided to become a history teacher is because when I got to college I became so upset at the many things the history classes I took before that point didn’t teach me. One of the events that upset me the most was when I learned the true history of Christopher Columbus. My earlier schooling just kept my knowledge at “Columbus was a brave explorer who sailed the ocean blue in 1492 and discovered America”. It wasn’t until college that I realized he and his men murdered, enslaved, raped, and tortured the Arawak people that they met. The fact that we have only 6 federal holidays in our country and one of them is dedicated to this piece of trash, is beyond infuriating. 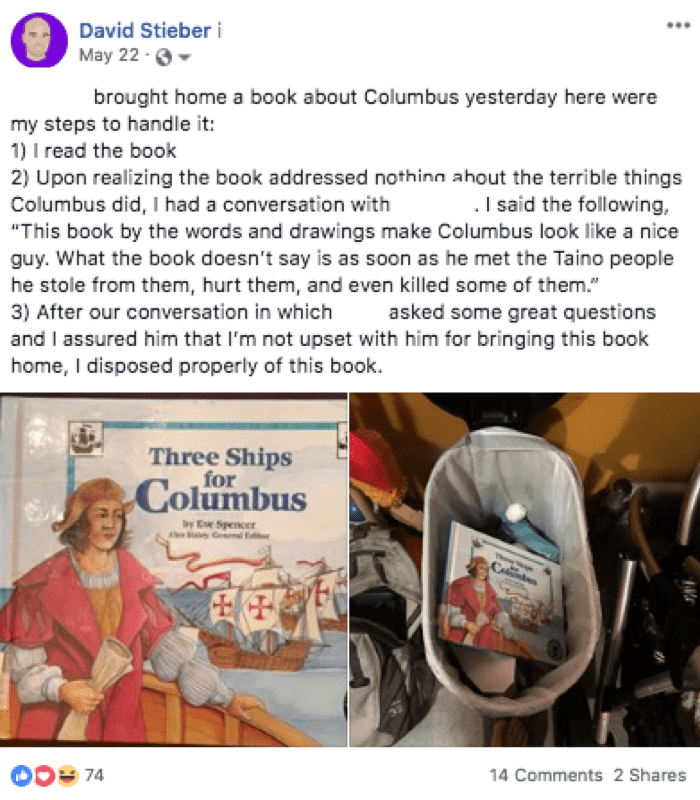 I thought about this incident over the summer; how little kids were still not learning the true history of Columbus. I decided this year to have one of my high school classes start a momentum to change this. As part of their culminating project on the legacy of colonization, they were to create a historically accurate, 1st grade appropriate children’s book of their own about Christopher Columbus. To take it one step further, I then partnered with some amazing teachers at a neighborhood elementary school to have my students read their books to the 1st grade students. 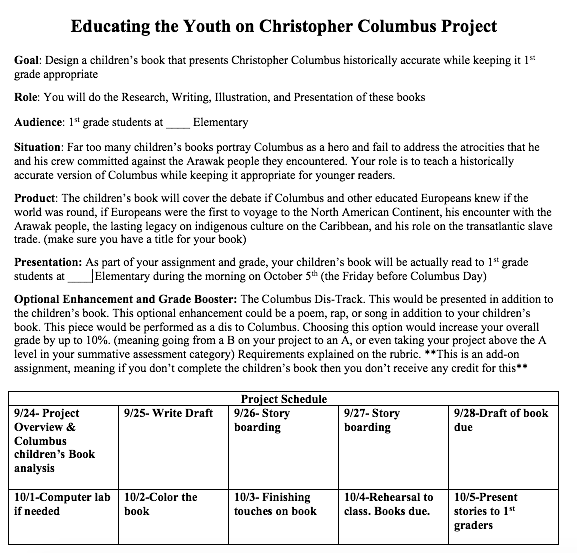 Before my students could begin to write their books, they had to research whether educated people believed the world was flat or round, if Columbus was the first non-indigenous person in this part of the world, learn about the encounter with the Arawak people, and then finally decide how Columbus should be remembered and if we should celebrate Columbus Day. All of these things were required to be in their book. Since you don’t have the books my students researched and then made in front of you, here are some spoilers: Educated people believed the world to be round, the Vikings came to North America 500 years before Columbus AND Phoenicians from the African civilization of Carthage most likely came to North America 1500 years before the Vikings. My students described Columbus’ encounter with the Arawak using 1st grade appropriate cruelty as, “Columbus enslaved all the Arawak’s and didn’t treat them as equals”, “Columbus took advantage of the Arawak’s because they were giving off good vibes, he hurt and damaged the Arawak tribe”, “He mistreated many women and children and forced them to do things they didn’t want to do”, “Because of the treatment of Columbus and his men the Arawak’s started dying rapidly because of the lack of the food, being abused or worse”. While I would love to include the beautiful pictures of my 11th and 12th grade students reading to 1st graders I must respect the privacy of all the students involved. After the visit, my son, who was in one of the classes that my students came to, said to me, “Dad, I don’t get how people could be mean to other people just because of skin color. It is just skin.” My response, “I know buddy, the messed-up thing is cruelty because of skin color and greed has been around since our country first started and it is still going on today.” My 1st grade son’s reply…a deep frustrated sigh. To view this piece on ChicagoNow click here. So why do I feel so guilty leaving them? In my twelve years teaching social studies in CPS, I’ve taught at two different high schools. I have recently made the decision to go to my third. When I left TEAM Englewood, the first public high school I taught at, I felt like I had to. TEAM, which opened in 2007, was where I started teaching and where I learned how to teach. I was a part of that school. Our principal used to call the original teachers the “founding teachers.” She gave us credit for helping to create that school. We gave input on everything from the hall pass policy, to the hiring process, to what we learned in professional development, and everything in between. When I left TEAM after seven years, it had changed to a point where I didn’t feel it was healthy for me to stay. The principal and assistant principal who I learned so much from had left and we had gone through two other principals who I felt were not helping the school. I was also grieving the loss of a baby. So personally, and professionally, it became necessary for me to make a change. The next school I worked at was Chicago Vocational (CVS), which is in the Avalon Park neighborhood. When I started teaching there, I wasn’t really prepared for the guilt I would feel about leaving TEAM Englewood. I felt like I didn’t belong at CVS, not because of the kids, but because it wasn’t TEAM. At TEAM I helped create the culture and influenced how the school ran. At CVS I was just another teacher. However, I quickly built connections with students and began establishing my presence in the classroom and school. This past school year at CVS has been one of my favorite years in the classroom. I have worked hard with my colleagues to create a curriculum that connects to kids while also pushing them to think, reflect, and analyze the world. I brought in twenty guest speakers from Chicago to speak to my students. These speakers included award-winning writers, poets, singers, rappers, veterans, and community activists. I helped coach our academic decathlon team. Our librarian and I created a spoken word program that got kids excited to write and perform poetry. Our students competed in Louder Than a Bomb, a youth slam poetry festival. I was happy at Chicago Vocational. Then in May I heard about a job opening for a social studies teacher at the high school in my South Side neighborhood. At first, I didn’t even apply to the opening because I was not ready to leave CVS. But I eventually decided to apply due to some major personal and professional reasons I couldn’t ignore: it is a neighborhood public school located in the same neighborhood that my partner and I chose to live in twelve years ago for its racial diversity; it is the school where my partner works; and it is where eventually my kids will most likely attend high school. The whole application, interview, and acceptance process took about one month. Throughout the entire process, I cycled through a huge range of emotions that I have been working through. I had to decide when and how to tell my students that I was leaving and heading to a new school. When I left TEAM Englewood, the decision was made during the middle of summer, so I sent every student I taught an email telling them that I was leaving. But I made my decision to leave CVS during the last few days of the school year, so I decided to tell my students in person. I experienced a range of reactions from them. One student became angry and asked, “Mr. Stieber, how can you leave us? !” Another reaction, that was even more difficult to hear, was the student who simply said, “Mr. Stieber, I will miss you,” and then walked away. I told the kids that I am not leaving because of them, and I am not. The kids are what I love. But the kids don’t understand that, and to be honest, no matter my reason for leaving, I am leaving the kids. In fact, during an interview, I was asked, “Do you even want to work here? Your body language seems like you don’t.” This caught me off guard because this person sensed how I felt. I had to tell them that I felt guilty for leaving my students at CVS. I told them that I am a loyal person. In fact I am so loyal I felt guilty for my first son, when my wife and I found out we were pregnant with our second son. I thought I might have blown the interview, and I was okay with that idea, but I also hoped that my explanation let them know that I was interested in switching schools—but the decision was extremely difficult. For better or worse, teaching defines who teachers are. Schools can shape teachers as much as teachers can shape a school. Our schools, then, also become who we are. So when a teacher decides to leave a school, it is almost like they are losing a piece of who they are. A colleague told me, when I talked to her about switching schools, that teachers can’t be martyrs for their students. Ultimately, we have to do what is best for us. I agree. The issue is since our city has many issues (hyper-segregation, lack of democracy in our schools, police violence, intra-community violence, resource theft), if we all did what was best for us, many of us would want to leave Chicago. As teachers, I believe there must be a balance between our willingness to stay and fight for our students, our schools, and our city, and our own mental health. Despite my own personal and professional reasons for switching schools, it is still true that CPS, and especially on the South Side, schools experiences extremely high levels of teacher turnover. A 2009 University of Chicago Consortium on School Research study found that a hundred CPS schools, many of them with majority-Black student populations, lose at least a quarter of their teaching staff every year due to reasons like “principal leadership, teacher collaboration, [and] student safety.” Losing twenty-five percent of a teaching staff per year causes many issues. Students feel like they are the reason that their teachers leave them, and will refuse to allow themselves to get close to their teachers because of the likelihood that their teachers won’t be there the next year. According to the report, having to rehire a quarter of the staff every year also leads to the hiring of “inexperienced, less effective teachers” and can also “produce a range of organizational problems for schools, such as discontinuity in professional development, shortages in key subjects, and loss of teacher leadership.” Why is it okay for certain schools, many of which serve Black and Brown students, to have teachers with little experience, while others have more experienced teachers? What would schools like the one that I am leaving need to make sure teachers are supported and want to stay? Ultimately, CPS needs to solve the rampant issues it has with inequality in resources and support for the sake of not only its students but also its teachers. Every school deemed “Level 2” should get twice the support of every school deemed “Level 1.” To make this happen, I am not saying we take from one school to give to another, but rather to get funding from other items in the city budget. One of the largest chunks of the budget is policing, which takes up forty percent of the city’s operating budget. Schools and the communities that they serve need resources, not more cops. There is currently $95 million slated for a new cop academy on the West Side, which many activists from the community have organized against. As I am about to begin my twelfth year at CPS, I have learned that it is only through giving all schools the equitable resources they need that teachers can dedicate their careers to educating their students. With more funds directed towards CPS and schools that need more support, these schools could afford to have more counselors, who could work with students and staff to provide trauma services and individual counseling. A Level 2 school could have a teacher aide for every single class. By fully taking care of our students, you are also taking care of teachers. This piece was originally featured on the South Side Weekly to view it click here. Here’s the audio version of my interview of Patricia Frazier the National Youth Poet Laureate for the South Side Weekly. I was able to create and ask the questions to her. Here is the much condensed print version found on the South Side Weekly. In May, Pat Frazier became the National Youth Poet Laureate—the first ever from Chicago—after being named the city’s Youth Poet Laureate last September. 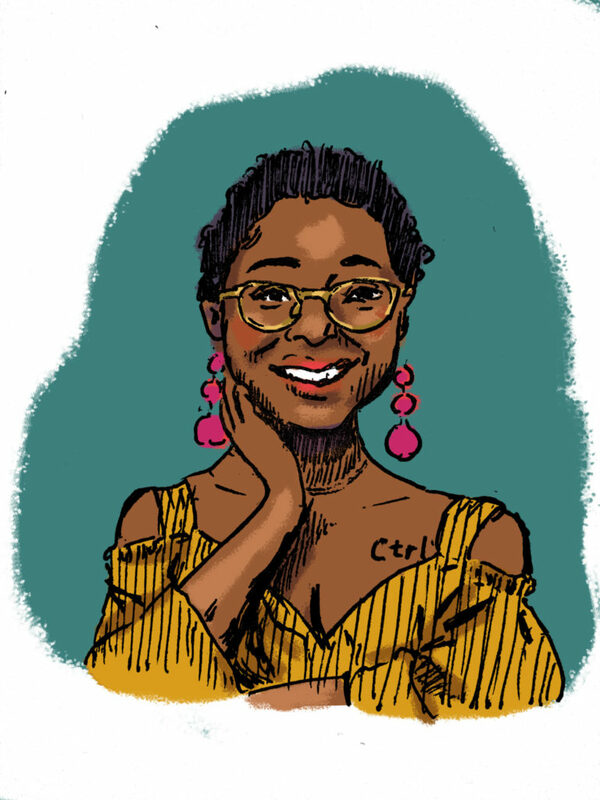 Inspired by poets like Gwendolyn Brooks and Safia Elhillo and her activism work with Assata’s Daughters—an intergenerational collective based in Washington Park that organizes actions around the city—Frazier’s first book of poetry, Graphite, will be out this September via Haymarket Books. In a conversation with the Weekly, Frazier talks about the intersection of her literary and organizing work. This interview has been edited for length and clarity. In a recent interview with Chicago Magazine you mentioned you can’t go back to where you grew up—the Ida B. Wells Homes—because they’re no longer there. Can you elaborate on the impact of feeling like you can’t go back to somewhere and what that means going forward? I think in a lot of ways I’ve spent the year since my grandmother passed away trying to revisit the Ida B. Wells Homes. A lot of those memories have to be told to me or have to be given to me through some secondary source. And a lot of my memories seem unreal a lot of the time. So that was a struggle with writing a book that was sort of an ode to this place I grew up [in]. I felt like it was my responsibility to tell these stories correctly, but my memory wasn’t always there. A lot of the poems are sort of a reimagination of the essence of how it felt to grow up. And that’s kind of painful. 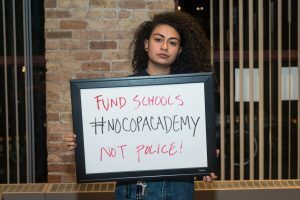 What should people know about the work Assata’s Daughters is doing around the city and in the #NoCopAcademy campaign? I’ve been with Assata’s [Daughters] for—I think—going on three years now. When I first joined I was very fresh-faced. It was wet-behind-the-ears activism. A lot of talking on Twitter. I do that still, but I think it was just me expecting to automatically go into a revolution and not knowing exactly what that looked like. It’s really, really cool to see people who have conflict with police and who have stuff going on at home who dropped out of high school to organize and be in actions and understand that just because they don’t talk pretty or just because they don’t have a high school diploma, that none of that means they can’t still be active and they can’t still be doing good things for the community. So I think Assata’s has opened that space for everyone to be a part of the movement. And not just people who are going through these modes of what I would say [are] white academia, right? Because I’ve sat on a lot of panels where I was the only Black young person and I’m in college and I’m the National Youth Poet Laureate, and a lot of those things are privileges that if I had not had them and if I was just like, oh, I’m from the projects, I have a story to tell, I wouldn’t have been allowed in those spaces. So I’m really thankful to Assata’s for giving those youth that space. You’ve got this huge platform as National Youth Poet Laureate. Do you feel an obligation to advocate for the city in the way that you’re doing? Because some people can just write and it can be about whatever, but not advocate as well. And you’re doing both of those things. Do you feel like it’s an obligation and how do you manage that in what you do? If I’m talking from an organizer’s perspective, obviously yes, it seems like an obligation for me. But if I wasn’t an organizer, if I was just National Youth Poet Laureate and I just wrote poems I still think that me having this platform—considering all the places I’ve been and all the places I come from—is already doing a lot for the city. I think that one of the poems that people love the most from me is “I Am Windy City,” which is just, like, don’t call us Chiraq. Don’t perpetuate these violent narratives that Fox News and all these other platforms perpetuate on a daily basis. That’s super important, but it’s also super important that I just do a poem about my mom that says, hey, we like the situation we’re in and you don’t have to judge her because she had me when she was a teen or you don’t have to judge her because of what happened with her reproductive system. What are some of the teachers or mentors you’ve had outside of the traditional school setting that have really influenced you along the way? Mama Brenda. She passed away, but her name was Brenda Matthews and I met her in an After School Matters program for poetry. I think that she was so important because she was another person who was always pushing us to break our boundaries, to hop out of our shells. The program was on the West Side and I was an introvert. I was so shy, so I never spoke to anybody. But in this one day she did a workshop, and by the end of the day everybody in the room was all crying together, sobbing together and just talking and listening to each other. And from that day forward it didn’t matter that I was from the South Side and all these other girls were from the West Side. It didn’t matter that I was an introvert and that I talked white. All that mattered was that we understood each other and that we were just together in that space. And I think that’s what good teaching is. And then Page May, who isn’t like a poetry teacher necessarily, but she’s one of the co-founders of Assata’s. She talks a lot, just like me, but she understands when to be quiet and when to step back and I think that’s really important. She also takes criticism extremely well. I don’t think I’ve ever met a teacher who I’ve had the audacity to give criticism too, but Page encourages it. If I was to say I want to be any type of teacher, I think that I would definitely want to follow up in Page’s steps; that’s the type of teaching that I would want to give to people. What do you envision for yourself down the road? If you, as the more seasoned version of yourself, some years from now look back and you’re like, okay, I was a success if I did this or if I experienced this or if I made this happen, what would those things be for you? I think about this a lot. I don’t know. I think ultimately I just want to be happy and I want the people around me to be happy. More concretely, I want to start a production company of all people of color. And there’s already kind of one here in Chicago, it’s called VAM [Studio] and I love them. I’ve done some work with them, but I want to start a production company like VAM, all people of color, queer folk where young people are just able to commune and tell their own stories. Poetry is very accessible. Like in most cases all you need is a pen and piece of paper or your phone or like just something to write on. Film, not so accessible. Film, you need a camera, you need equipment, and not just hundreds of dollars, thousands of dollars. So just creating that space for young people who want to see images that inspire them to imagine different worlds. I want my company to hopefully put HBO out of business. The release party for Graphite will be held at Young Chicago Authors, 1180 N. Milwaukee Ave., on September 1st at 7pm. Dave Stieber is a National Board Certified Social Studies Teacher in his eleventh year of teaching for CPS. He last wrote an op-ed for the Weekly about why CPS teachers should send their children to public school. In my first few years of teaching, I loved my students so much that it seemed almost impossible for any other educator to care about their kids more than I did. But after having children of my own, I realized that while I still love my students, I’ll always love my own children more. Although I’ll always go way above and beyond for my students, there is nothing that I wouldn’t do for my own children. I don’t say these things lightly. I’ve made a conscious effort to work for my students and the community. I’ve constantly worked to create a curriculum that teaches my students to question power structures and to work to create change when inequalities exist. I’ve written countless articles about my students and ways to improve our schools. I’ve been arrested for fighting to keep Chicago Public Schools (CPS) from closing fifty schools in 2013. At times, this commitment to my students has put me at odds with my administration, incited fear of write-ups, and produced threats from strangers. These risks sometimes make me question my desire to defend my students. But like any parent, I would do anything for my own children, risk more, and ignore idle threats. My drive to protect my children and their well-being, education, and opportunities is stronger than anything I’ve ever experienced. It’s like that moment when you have children of your own and finally realize how much your parents actually love you. It is a window into the emotions of a decade’s worth of my former students’ parents. I now know more completely what those parents wanted for their kids, and wonder if I had fought hard enough. Did I fight as hard as I would have for my own kids? I was recently interviewed by a reporter for the Weekly about my decision, as a CPS teacher, to send my kids to CPS. The interview was a follow-up to a study by the conservative Fordham Institute done back in 2004 which said that thirty-nine percent of Chicago Public School teachers didn’t send their own kids to CPS. As a parent, I can understand why some teachers wouldn’t want to send their kids to CPS. Since 1995, mayors of Chicago have had absolute control over Chicago Public Schools. This power lets mayors appoint the CEOs of CPS and the school board members; therefore, the school board, without question, follows whatever terrible idea the mayor may have. In my eleven years of teaching in CPS, I have had eight different CPS CEOs. The Chicago Public Schools system is and has always been a mess at the leadership level. Believe me: like many other educators, I am beyond frustrated with the way that CPS is and has been run. Working to improve CPS as a teacher (and parent) is extremely hard and, at times, absolutely demoralizing. It would be great to shield my own children from the struggles that every kid in CPS faces. But that wouldn’t help improve our city, nor would it fight against structural racism and inequality in our school system. It hurts to have underfunded schools for my students, and now I feel that same hurt exemplified with my own child. It hurts that during our oldest son’s first year of preschool in CPS, they tried to cut the preschool special education teacher from his school. A few active parents made me aware of this. These parents created a petitionand contacted CPS, the alderman, and the media. I wrote an article about it, and together we organized a “Play In” to bring attention to this proposed cut. During the “Play In,” kids simply played while parents spoke at the school board and met with the principal, and it became a celebration instead of a protest. On the day of the “Play In,” CPS decided not to cut that position. At the time of the “Play In,” I was exhausted. The only reason I marshalled enough energy to fight as hard as we did was because it was my son’s school. If it hadn’t been my son’s school, I likely would simply have felt upset for that school and moved on. For this reason, I believe that if you work for Chicago Public Schools, you should send your kids to CPS. I would go so far as to say CPS employees should be required to send their kids to CPS. Chicago Public Schools teachers are already required to live in the city, a policy that I actually agree with. I believe it creates a connection to our students and gives us responsibility for their success that can only be fostered by common ground and common experiences. To fight for the schools our students deserve, we must also live in the city, send our kids to CPS, and fight for the city that we all deserve—as frustrating as that may be at times (or all the time).With skin in the game, CPS’ actions become personal, and the intensity with which we fight for a just education becomes stronger and more meaningful. As teacher-parents, our involvement benefits everyone because we are able to evaluate a school unlike any other parent. This year, my partner and I made our son’s school administration aware of a teacher that needed more assistance, helped get the morning entrance policy changed, and made the school aware of an unlocked and open outside door by the preschool. We have a trained eye for what works and what doesn’t. We have the experience and the skills to identify needed improvement, and do not tolerate inefficiency—even more so with our own children at the hands of CPS. We have the capacity to understand the system, and we know the right words to say to get the change we need to meet the expectations we hold. If we want to make Chicago change, then our professional lives and our own personal lives must intertwine. They must coexist. We must be invested beyond our paychecks. Our fights, rallies, strikes, and decisions must become more passionate and personal. I believe that Chicago Public Schools must end mayoral control of schools, that Chicago needs an elected school board, that Chicago must stop stealing TIF funds from Black and brown neighborhoods for downtown projects, that there is no reason to close a public school, and that money should go to students and schools as opposed to police, jails, and a new cop academy. However, given the hyper-segregation of Chicago and the systemic racism of our school system, it is evident that even within CPS—where all schools need support—schools that teach predominantly Black and Brown children need even more resources. So while I believe that all CPS teachers should send their kids to CPS, I am much more understanding of a teacher of color choosing to or feeling forced to send their child(ren) outside of CPS than I am of a white CPS teacher doing the same. If, as a white teacher, you are willing to teach Black and Brown children in CPS, but unwilling to send your own kids to the same system from which you profit financially, it says more than a few things about your savior-like mentality. Teaching is about building connections with our students. We teachers may differ from our students in terms of race and/or economic status, but when we live in the city, pay taxes here, and send our kids to the same public schools, our students will see that. They will see that despite our differences, we share many common bonds—most importantly, the desire to improve the city that we all call home. To view this piece on the South Side Weekly click here. I want Jon Burge’s pension. Chicago Police Commander Jon Burge was entrusted to protect but instead he and his Chicago Police Officers tortured over 100 Black men. Commander Burge and his crew of Chicago Police used torture to force confessions to crimes that 100 over Black men did not commit. To this day some of these men are still in jail. Some were imprisoned for 20-30 years before finally getting their freedom. Jon Burge because of the statute of limitations was not found guilty of committing torture. He got 4 and a half years for perjury and was out in less than that. He’s a thug who cost the city of Chicago over $120 Million dollars. His court cases, abuses, acts of torture, and legal fees cost our city $120 Million. A criminal that is still getting his $4,000 a month pension from the city. So I want Jon Burge’s pension. I want his pension to go to the Chicago Torture Justice Center. A center created to help victims of police brutality and torture. Victims past and present. The Torture Justice Center works with the Burge torture survivors and helps connect them to schools and organizations so they can share their stories of survival. I want Jon Burge’s pension to go to the torture survivors. These survivors had the foresight to have what happened to them be taught in Chicago Public Schools as part of the Reparations Won curriculum taught to all 8th and 10th graders. I want Jon Burges pension to go to the activists and students. Activists who fought to help the torture survivors get justice for torture then. Activists and students who are now fighting against the proposed construction of a new $95 Million cop academy on the west side of our city. Activists and students who realize the police don’t need new concrete for a $95 Million building to make changes to police training. The Chicago Police Department (CPD) has already cost the city nearly 1/2 of a Billion dollars for its continued acts of police brutality. Why should CPD be rewarded for harming citizens with a new building? Prove you have cleaned up your act CPD, then maybe after schools are fully funded, neighborhoods are revitalized, then CPD can ask for more funding. I want Jon Burge’s pension and that $95 Million earmarked for the police academy to fund jobs in communities on the South and West sides. To invest in quality of life not the criminalization of it. I want Jon Burge’s pension to be put into a new ad. campaign. Let’s call this campaign “Education Not Incarceration” or “Invest in Our Neighborhoods Not Our Prisons” or “Jobs and Opportunity will Help Everyone Not More Police”. Prisons and police do not make our neighborhoods safe. Jobs, fully funded schools, neighborhoods with services, resources, and opportunities do. So let’s create a fund. Let’s call it the Chicago Neighborhood Investment fund. And let’s make the first check deposited in this fund be Jon Burge’s pension. Or let’s do even better. Let’s make Rahm reallocate his $95 Million check earmarked for the cop academy to deposit in this account instead. *Credit for this idea comes from Black Lives Matter Chicago and their campaign to stop former Chicago Police Officer Dante Servin from receiving a pension after his murder of Rekia Boyd. This is a FB Live conversation (link at bottom of this post) with the amazing Dr. Roshunda Allen, Professor at Tougaloo College and myself. We addressed educational issues impacting Jackson MS, Chicago, and our country. We specifically talked about the idea in Denver of having a 4 day school week and also about gun violence in our schools. Chicago spends 40% of its entire operating budget on policing. In addition the city has paid out over $500 million on police brutality cases. On top of that Rahm thinks it a wise choice to spend $95 million more on a new cop academy. Meanwhile those that run Chicago Public Schools (don’t forget Rahm appoints them) voted to close 5 predominantly Black public schools. Add that in with the 50 plus Black schools closed in 2013. It is not conspiracy to say that Chicago wants to incarcerate, not educate, its Black youth. Many in the city see the connection. If you underfund and then close schools, while continually increasing funding to police it becomes apparent what the goals are. A budget is a political document, not just a financial one. It shows what the city prioritizes. Chicago prioritizes criminalizing our youth, NOT educating them. Rahm says he cares about kids, but he does NOT send his own kids to CPS. So he can say whatever he wants, BUT unless his own kids are in the CPS system his words mean jack. Chicago is filled with harmful policies past and present such as redlining, blockbusting, and gentrification. Actual policies created and implemented by the city that targeted and harmed Black communities in our city. School closings, school turnarounds, and school phase-outs, is just the new or continued version of these policies that target and harm Black communities. While these policies continue to destroy education for the children in our city, Rahm and his crew make sure to always fund policing. The Chicago Police Department (CPD) is responsible for torturing and killing Black Chicagoans. CPD has been proven to cover up its own crimes and illegally detain people in secret sites. In Rahm’s Chicago, if a school is deemed unsuccessful, under his bogus school rating system, then that school is punished. Charters will be built in the area and then the school will be closed or phased out after having it’s funding systematically cut. The police do not receive this same treatment. In fact it seems as if the police are rewarded for the more flawed that they are. Students and schools punished, police rewarded. The Chicago Police Department is getting a brand new $95 Million Cop Academy on the Westside. More for incarceration and less for education. Our children in CPS are treated like they are in a police state. Metal detectors, police with guns in the school. Limited resources. Terrible Food. Yet, students are told, if you work really hard you can overcome all of this. You can make it. No doubt the amazing kids in Chicago do overcome. BUT kids should not have to overcome. Kids should just have what they need. So instead of building a new cop academy invest that money into the schools. 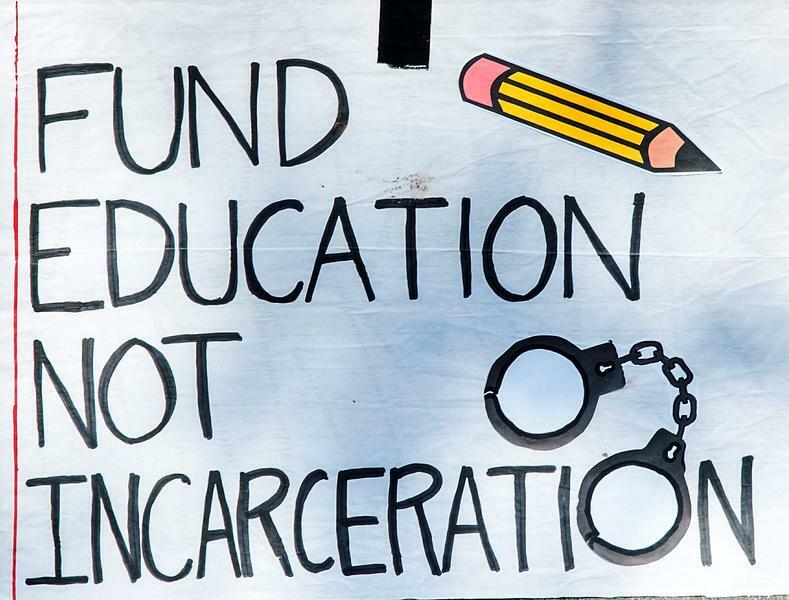 Instead of policing and incarceration we could try fully funding education. Closing over 50 elementary schools in 2013 was not enough. He wants more closures. Now it is TEAM Englewood, Roberson, Hope, and Harper high schools. Eliminating all of the public neighborhood high schools in Englewood. Rahm says screw the Black community. Because surely if Rahm truly cared about the Black residents of Chicago he would be upset by the fact that over 200,000 Black families have left the city. He would rather close a school than fix a neighborhood. Put Incarceration over improving communities. This is policy. These are calculated choices. This is Chicago.